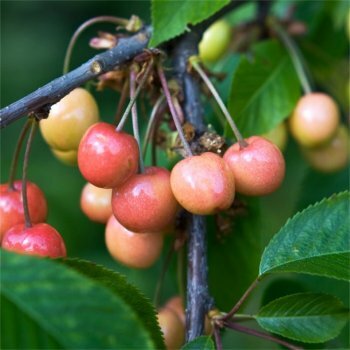 Merton Glory is the top choice of cherry tree if you're looking for large, white, sweet cherries. The yellow/white cherries of Merton Glory are heart shaped rather than round, flushed red and have a fantastic flavour. The fruit on these cherry trees are ready for picking in late June. Cherry Merton Glory is ideal for more compact spaces as it has a distinct upright habit although it is not self fertile and so a pollinator is required - Stella or Sunburst are ideal. *Indication of the un-pruned height of this cherry tree variety on different rootstocks in 10 years. Variations will occur due to position, pruning etc. Merton Glory Cherry trees should be spaced according to their rootstock, for example a Colt (semi-vigorous) rootstock will require approx. 4 metres between trees, whereas a Gisela 5 (dwarf) rootstock will require approx. 3 metres between trees. Our pot grown cherry trees can be planted at any time of the year, whereas bare root cherry trees need to be planted between November and March. When planting, remove weeds and grass within a metre of your desired planting hole. Dig a square hole as deep as your root mass and approximately 2-3x as wide. To help fruit trees establish more effectively, sprinkle rootgrow in the hole. Remove the pot, gently loosen the roots and place into the planting hole. Mix 50% of the original soil with 50% compost, fill in the hole and firm around gently. Avoid banking the soil up around the collar of the tree. We recommend planting Merton Glory cherry trees with a stake and tie to ensure the roots are well anchored. The Cherry Tree Planting & Care guide has further information and videos. If you’re planting in spring or summer, water well for the first few months. Increase watering if there are extended periods of hot or dry weather. If planting in autumn, you may only need to water a little. Keep the area free of competing weeds and grass for several growing seasons and if needed, use a rabbit guard. Top tip: To check if the soil requires further water, dig a finger into the soil a few centimetres. If the soil feels even slightly moist, it does not need further watering. If it feels dry, water and repeat this test again. Prune Merton Glory Cherry trees for the first few years after planting to ensure a healthy, natural shape with a strong branch structure. Your tree should have one central leader and several side shoots. Straight after planting, trim the main stem back to approximately 120cm and the remove the lowest laterals, allowing at least 50cm of clear stem. Carry out this formative pruning in early spring. To maintain a strong branch structure, aim to have 7 or 8 main branches which are well spaced, allowing enough light and air inside the canopy. Prune any crossing, damaged or diseased branches, whilst making sure the overall form of your tree is balanced and attractive. Stone fruit trees, such as cherries should be pruned in summer when they are stronger and less susceptible to disease. 4-5 metres (13-16feet) in 10 years - ideal for smaller orchards and individual specimens. 3 metres (10 feet) in 10 years - ideal for smaller gardens as specimen trees, patio growing and suited fan training.